Rick has a long sailing history with costal and blue water experience. He is Coast Guard licensed to Captain up to a 100 ton vessel so you'll be save and sound under his watch. 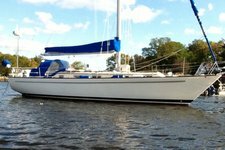 He's been offering private charters on the sloop Nirvana for the past 5 years. With coastal and blue water experience, Rick can insure that your time on the water is safe and fun. Our trip far exceeded our expectations! Rick is an incredible captain and he made the experience fun and memorable! He was amazing with our kids, and my husband who I got the gift for described the trip as the best day of our summer. I cannot say enough good things about Rick and his boat! Anybody would be lucky to spend a day on board this boat! Absolutely wonderful experience. Rick was very friendly, attentive, and a seasoned sailor. Very flexible & responsive. We had a wonderful time! Weather was beautiful -- warm & windy - a great day to be on the water. Would highly recommend Rick and his boat.